Sometimes these sketches end up as panels in Supergirl. 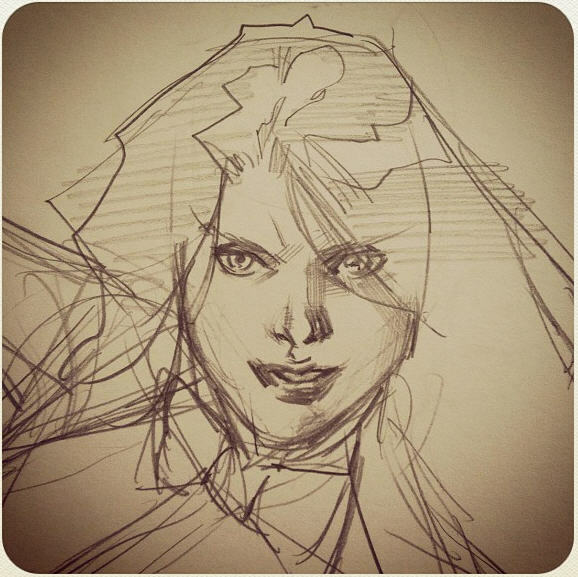 So could this be Zatanna? Could she be saying it's possible to download English into Kara's brain? Superman #10 came out this week and it was hard to get excited for this book with the knowledge that the creative team of writer/artist Dan Jurgens and artist Jesus Merino are simply keeping the seat warm for the next big creative team of Scott Lobdell and Kenneth Rocafort. I still don't have the best sense of this Superman although the Jurgens issues have felt like most of the main attributes of the main character are in place. But it is the ancillary stuff that has been missing here, the rest of the mythos. And how much can Jurgens really do here knowing that his time is short? Of course, Jurgens was/is probably as handcuffed as George Perez was on the title. Because just how much can be revealed about the 'now' Superman when Grant Morrison is still building the 'then' Superman. The problem here, as discussed in other places in this blog, is that there is simply no foundation for this new Superman right now in the DCnU. As readers we are sort of flying blind, falling back on assumptions of prior incarnations of Superman to make this one make sense. Now I am not a reader who necessarily needs to fall back on 'does it matter'. I don't need every issue to bring some massive continuity effecting event. I just want good stories. And this story of the untouchable Anguish and the wrong secret identity guess was ... okay. Could part of that be that Jurgens was holding back? 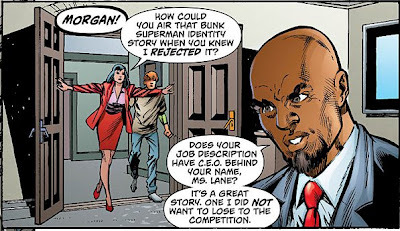 Last issue, Morgan Edge televised a story where blogger Vic Barnes named Spencer Becker as Superman's secret identity, an proclamation based solely on the weakest of circumstantial evidence. In fact, the story was so weak that Lois had already rejected it. So this is an interesting side story in which journalistic ethics butts head with sensationalism and ratings. I had wondered if part of what was going to happen here was that Lois was going to step down from her administrative position and instead return to her journalist roots. And I thought I wanted that. 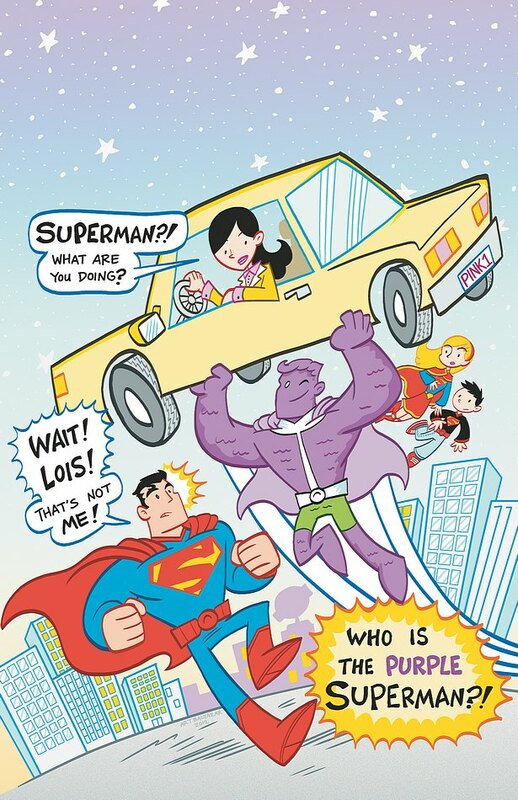 While I will always love Lois as the intrepid investigative reporter, someone searching for truth and justice, I hope she doesn't leave this job. If anything, we need Lois on that wall, fighting for the truth now on a larger scale. As for Anguish, the untouchable woman, she reveals to Superman that she broke into that bank vault to get a locket with her mother's picture in it. It is clear that Anguish's father abused her in some way. It is never really stated whether it was neglect, or physical abuse, or sexual abuse. But her power of being unable to be touched or feel anything at all does make me wonder if it wasn't some combination of all of them. 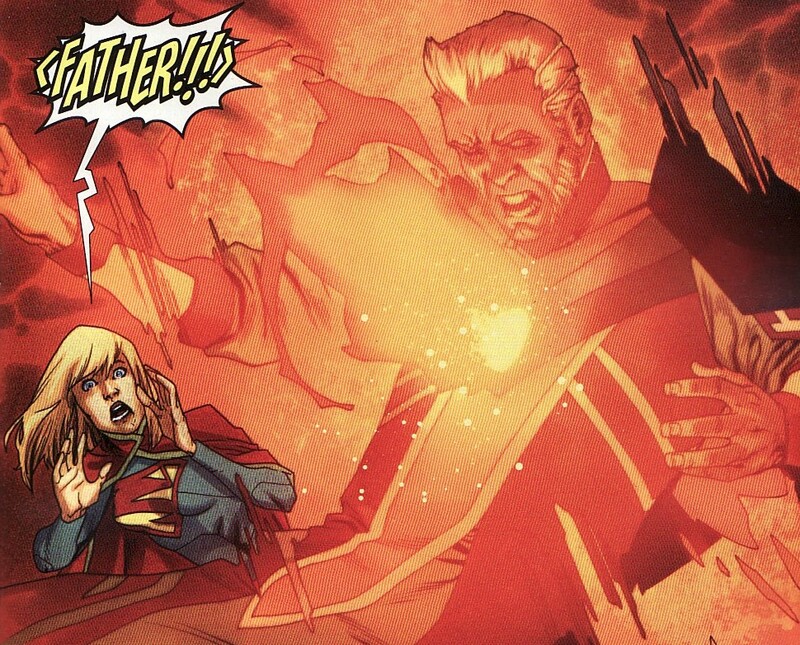 During this time, when her mother was gone and her father was 'caring' for her, Anguish developed this power to 'automatically' alter her density. Thus, she can be walking on the street and hold the locket but also have bullets, heat vision, and punches go through her. It is the ultimate defense mechanism ... interesting given the traumatic beginnings. That power alone would be enough. But somehow that density also gives her super-strength, enough to hurt Superman and hurl cars around. Too bad because the first power would have been enough for me. In fact, realizing that physical attacks are worthless, Superman decides to go after the one thing Anguish does care about ... the locket. But the battle shatters it. It causes Anguish anguish. She says she was simply going to take the locket and disappear. She didn't want all this drama and damage. But if Superman robbed her of what she loved then she will do the same. And, unfortunately, she thinks Superman is Spencer Becker. She storms off to Becker's house. The truth is wouldn't every super-villain be heading off to Becker's house? This was my problem with Marvel's Civil War. As soon as Peter Parker unmasked, every rogue would be on their way to 'visit' Aunt May and Mary Jane. One thing that Jurgens does establish for this new Superman is the notion of a secret identity ... or lack thereof. 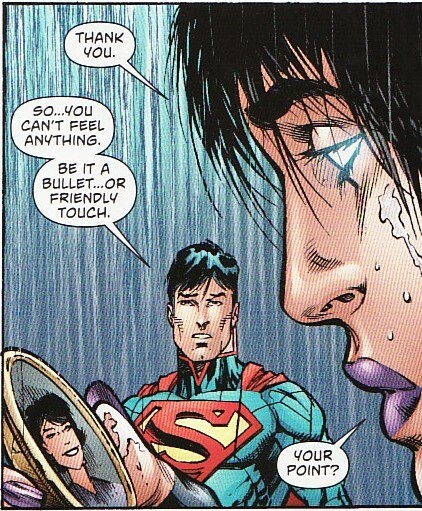 Most people don't think Superman has a 'secret identity'. They think he is Superman only. And Superman doesn't do anything to dissuade people of that idea. 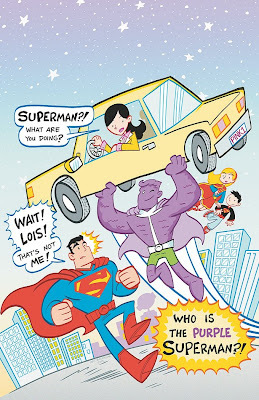 When Lois arrives at the scene of his fight with Anguish and goes into reporter mode, Superman deftly sidesteps Lois' questions, never really answering her inquiries about where he goes when he isn't working. I love Jimmy's ideas about it. Superman is on a tropical island with anti-detection technology and a harem. As I said above, I like that Lois is trying to stand up for the truth in journalism. Edge cares for ratings and even if he is wrong about this Becker story, even if it brings harm to Becker, even if Lois is right, Edge will be happy. Ratings went up. How will Lois combat her boss about this problem? Should be good to read. While villains don't descend on the Becker house, television crews do. This includes Barnes who comes close to a lot of truth but missing the mark. He stalked Becker's work building where Superman is often seen flying around (the building is across the street from the Daily Planet). He wonders if there is a tunnel under this house which exits far away so Superman could leave secretly (similar to the tunnel under the Kent house in the Silver Age). Even Becker's disheveled appearance is explained as his working out in the nearby gym during his lunch hour. Some assumptions close to reality but not true. Anyways, Anguish arrives hoping to kill Mrs. Becker and the family's young daughter. 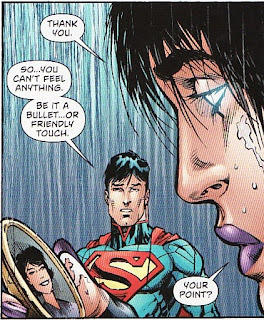 Knowing that fighting Anguish is impossible, Superman again goes back to the one thing that has effected her. He brings her back the locket, repaired via heat vision. And then he goes into pure Superman mode. It is clear that Anguish is hurting psychologically. And it must be maddening to never be touched, even in a kind way. He offers her help. That is Superman. But like many victims, Anguish thinks she cannot be helped. She fades away. It is a sad ending. And who knows if we will ever see her again. But it also shows that even Superman can't solve everything ... certainly not by punching it. It was the most powerful moment in the story and for me the best moment. The story ends with Barnes being punched out by Becker and with Lois still hammering away about what Superman does when he isn't Superman. If Superman has been around a while, you would think that this argument or question or denial would be water under the bridge. It is another example of how the time gap between books is awkward. So this was an okay story. The Lois in opposition to Edge moments and Anguish's rain-soaked goodbye stand out as the high points. The art was fine if unspectacular. 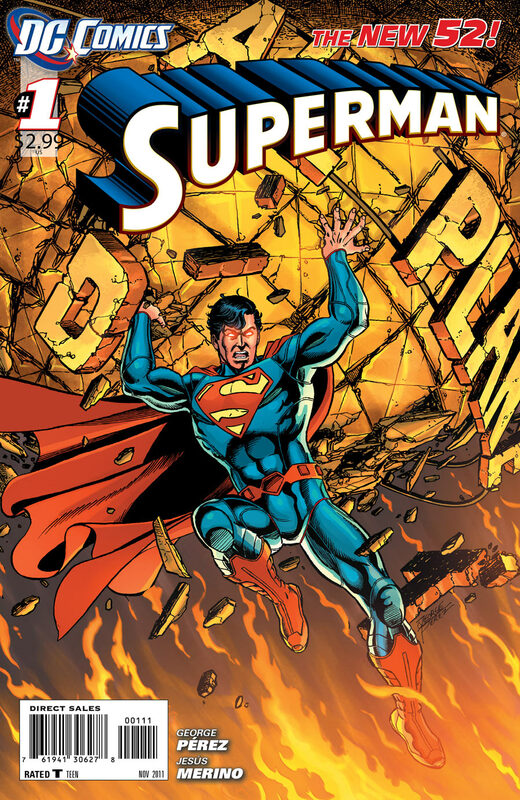 And so the Dan Jurgens time on the title comes one step closer to the end. Welcome to another blog crossover among friends where character pages from DC Secret Files and Origin issues are shared. These 'files' are a sort of nouveau Who's Who pages tucked between the stories of these oversized issues. I recently stumbled across this Michael Turner Supergirl page. Earlier this month I went to the Granite State Comic Con and really got elbow deep into the dollar boxes, walking away with a ton of stuff cheap. 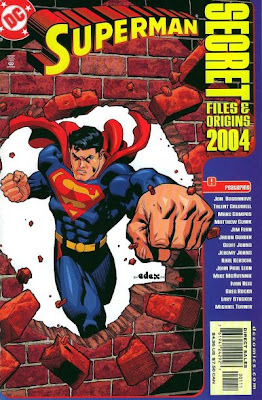 One of the things I got, on a whim and without flipping through, was the Superman Secret Files and Origins 2004 issue. I can't pass up high-page count books at a low price! The convention gods have shined on me in the past when it came to Supergirl. 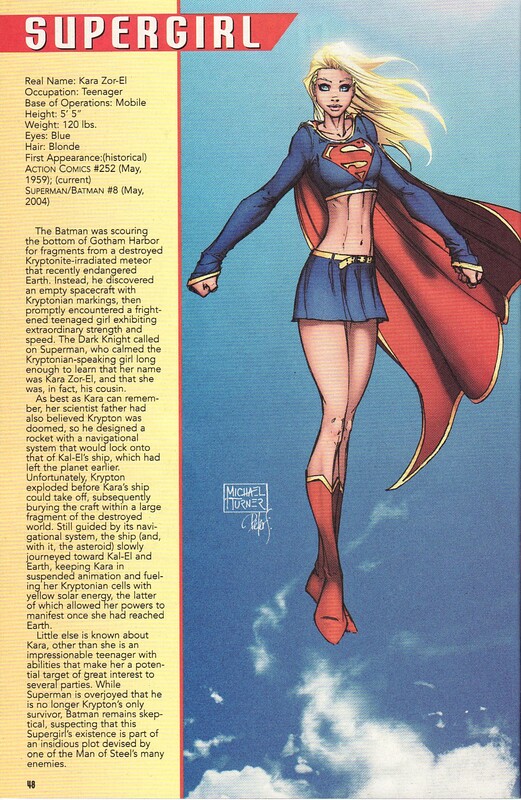 Sometimes it seemed that at random I would pull out a Batman Chronicles or Adventure Comics 80pg Giant or Four Star Spectacular that happened to include a Supergirl story. Is there a greater force at work here? Anyways, what was in the back of that book? A Supergirl Secret Files page sporting Michael Turner art. This was basically right around the time the Supergirl story arc finished in Superman/Batman so it is pretty sparse on facts. And while I am not the biggest Turner fan, there is no denying his vision was crucial to the inception of the last Kara. Looking for more Secret Files character pages? Head to these fine sites! And here is the cover of the Superman Secret Files and Origins 2004 issue for anyone interested in hunting it down. It has been in the back of my mind since Supergirl #5. Kara saw the replay of his murder when she activated the memory crystal that was in her pod. But we didn't see the shooter. The details of Kara's origins on Krypton, about her flight to Earth, are slowly being revealed in the comic. I have all sorts of theories about the wheres, the whens, and the hows. But who shot Zor-El has been the one mystery I keep coming back to as the answer may have a huge impact on the character. And then we got the solicit For Supergirl #0 which included this statement. • On the eve of Krypton’s destruction, who sent Supergirl from Krypton to Earth – and why? The answer is not what you think! 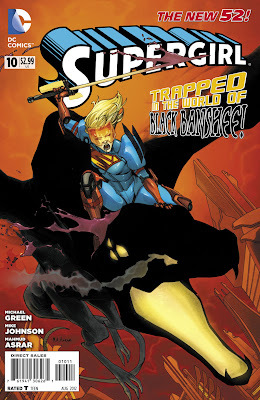 • Plus: Learn the answer to a mystery that’s been driving Supergirl mad for months: Who shot her father, Zor-El?! We are a couple of months away from finally learning the truth! But the return of Dallas on television reminded me of the big 'Who shot J.R.?' phenomenon which swept over American back in 1980. 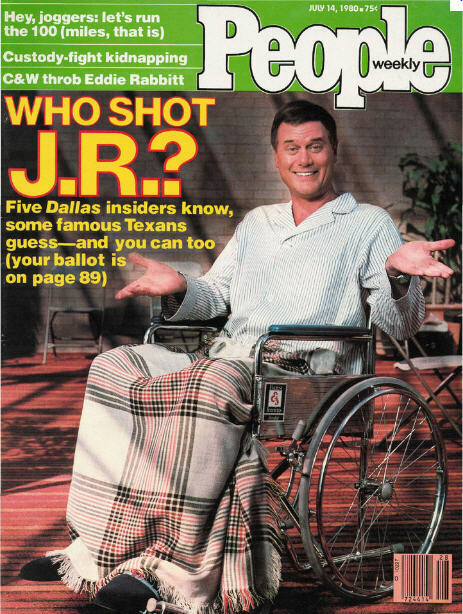 So I thought I would take a poll to see who readers think shot Zor-El. The poll is on the upper right of this site. We are somewhat short on suspects. But these are who keep cropping up in my mind. I post them in the order of likelihood I have given them. I would love to hear what everyone else thinks! So please vote early and vote often! 1) World Killer scientists - It has been implied that Zor-El was one of the scientists working with the World Killer technology. The fact that the force field protecting Argo City is the same as the force field projected by the World Killer, Flower of Heaven lends credence to that. It also is hinted that this technology was controversial, maybe even illegal or done under the radar. 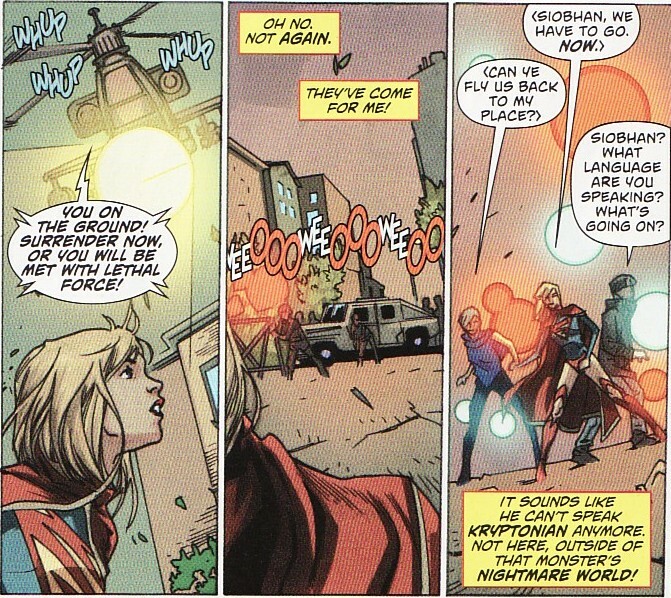 Zor-El may have been about to divulge the secrets of the World Killers (perhaps Kara's part in that experimentation?) on the memory crystal. And maybe the other scientists wanted to keep this information on a need-to-know basis. There was no other way to silence Zor-El except to ... well ... silence him. 2) General Zod - this is something of a variant of the World Killer scientists. It might be that the World Killer tech was being tested so it could be weaponized by the Kryptonian military. 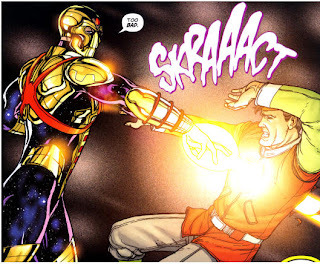 And maybe Zor-El was going to blow the whistle on the whole thing. Even giving Kara that information would be leaking military secrets. So maybe perennial House of El enemy General Zod decided to take matters into his own hands. In the Silver Age, Zod was tried for making an army of Bizarros to try a coup d'etat. Maybe this time it was an army of World Killers he was making? It would echo nicely with prior incarnations. 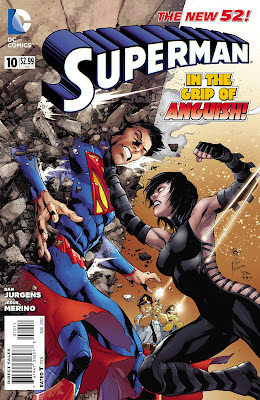 Of course, that would make Zod more of a Supergirl rogue, even trumping Superman. Plus, it would mean the re-imagining of Zod would first appear in Supergirl rather than Action or Superman. I don't think DC or Grant Morrison would be willing to hand over the keys to such an important Superman character like that. 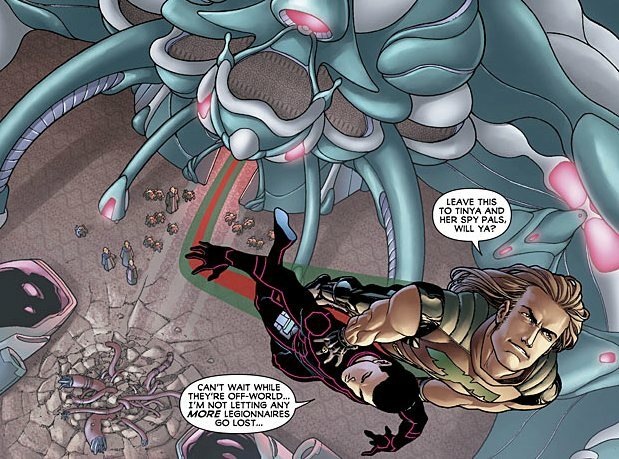 3) Alura - this is the suspect I am most worried about. Alura had a complicated relationship with her daughter under Sterling Gates. It seems that maybe she will have a complicated relationship with this Kara. We first met her as a vision on Argo, pronouncing her love for Kara and urging her daughter to save herself. But in the last issue, it seems Alura might have a more traditional view of what Kara should have been doing on Krypton, different than what Zor-El was doing. Could Alura have been so against the way Zor-El was raising Kara that she became irrational? 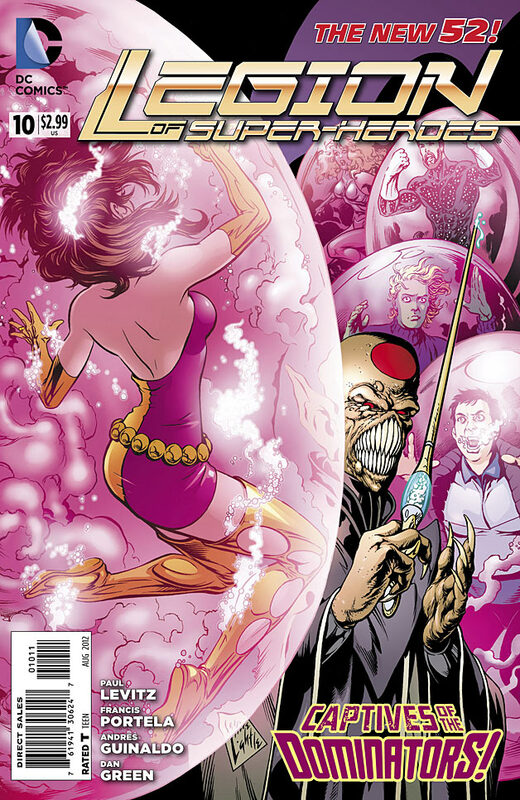 Could Zor-El's plans of saving Kara been so wrong to Alura that she took matters into her own hands? It would radically and irrevocably change who Alura is. It would substantially darken Kara's past. Unfortunately, that might seem desirable to DC. It would be utterly and completely wrong. I strongly hope that Alura didn't do it. And I can't imagine that it would stand long-term before being ret-conned by some sort of 'Kryptonite poisoning' panacea. 4) The World Killers themselves - again this might be a riff on the first couple of guesses. Maybe the world killers were under the control of one of the scientists. They certainly don't seem happy about was what done to themselves. So maybe they decided to get some revenge and off one of the people responsible for their condition. It would seem beneath them to simply shoot their enemy. And the blast doesn't look like one of the Flower of Heaven's blasts. And as Reign says they awoke in their tubes on Argo, I don't think they would be released and then somehow go back to the tubes or have been forced back to the tubes. So I don't think this is likely. 5) Jor-El - the dark horse. We haven't heard about any great relationship between the brothers. Maybe there is a family rift? 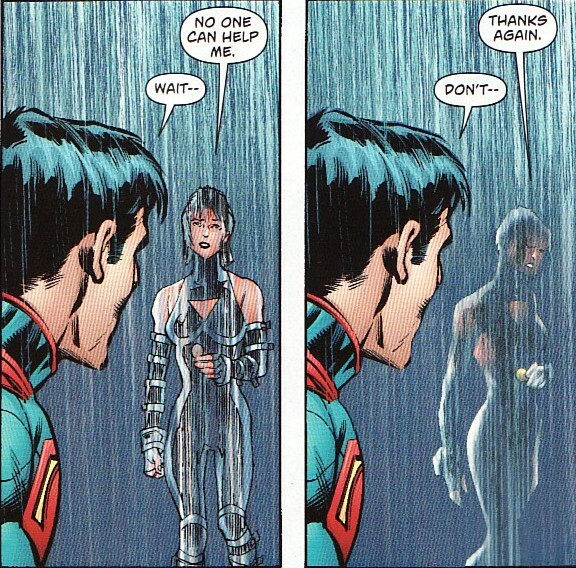 Maybe that is why Kara doesn't want to hang out with Kal? Of course, for the same reasons as Zod only more so, I don't think this is possible. 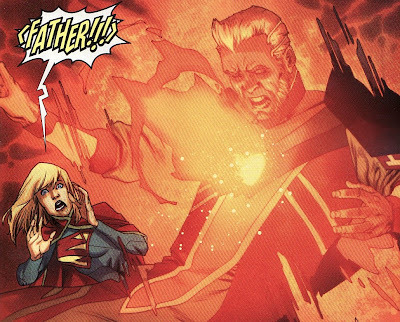 Jor-El guilty of fratricide? The noble scientist a murderer? No way. 6) Other - we don't know many others who were there and could have done it. So who else could it be? The chest wound is very similar to Reactron's fatal wound from the last incarnation of Zor-El. Was there a Kryptonian Reactron in the DCnU? Any other thoughts? If you vote other, please post any ideas you have! Of course, as new information is revealed, the suspect list will change. But who do you think now? 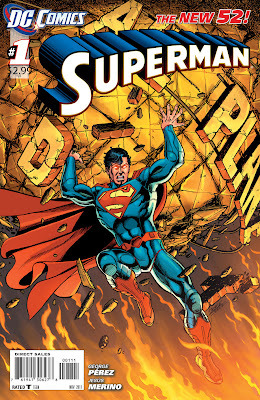 The George Perez interview at the Superman Day in Metropolis has made the rounds of the big comic sites (here is the link at Bleeding Cool: http://www.bleedingcool.com/2012/06/24/george-perez-talking-about-being-rewritten-at-dc-comics/). The entire interview is available at a number of sites but Bleeding Cool does a good job of parsing out the pieces that intrigued me the most, parts that dealt with Perez run on the New 52 Superman title. Now I didn't particularly like that run on the book. It seemed inscrutable, there were parts that made no sense, and there were parts that were focused on that seemed inconsequential in the grand scheme of things. At the time I wondered just why an arc like that would have been the foundation for the re-introduction of Superman to the DCU. Perez opened up about the problems with this arc in that interview. Unfortunately when you are writing major characters, you sometimes have to make a lot of compromises and I was made certain promises, and unfortunately not through any fault of Dan DiDio, he was no longer the last word, lot of people making decisions, going against each other, contradicting, again in mid story. The people who love my Superman arc, I thank you. What you read, I don’t know. After I wrote it… I told them here’s my script, if you change it, that’s your prerogative, don’t tell me. Don’t ask me to edit it, don’t ask me to correct it, I don’t want to change something that you’re going to change again if you disagree. No no, Superman is a big character, I was flattered by the responsibility, but I thought this was getting a little tough. I find it interesting that Perez's scripts were under such high scrutiny, that he had to get through not only his own editor but also Dan Didio and other people who also had 'the last word'. Who are these people? And if one decision was made for the first issue and that decision was reversed for issue two ...well, no wonder the book felt completely disjointed. Perez even didn't want to be told about changes! I suppose the question is ... just what were these changes? Would the purely Perez story be better? Were the rewrites needed? Or at least part of them? I am sure the truth is in the middle somewhere. One of the things that has bothered me about the New 52 has been the extreme short leash that some creators had on their books. Before many of these titles had a chance to gel and find an audience, the directions were changed or the creative teams were removed. I have wondered why DC didn't let these books have a longer time to find their way ... or, more importantly, why 'the powers that be' didn't recognize that a premise wasn't going to work. So to read that Perez was given carte blanche for a year when he redid Wonder Woman, that he got his chance then, was interesting. Is the market so volatile now that a book can't breathe for a bit? That creators can't get to a point where some of their vision is achieved? Or are the people deciding on which books get a green light making the right decisions if things need to be blown up so quickly? I have to admit that the different timelines in the DC books have been confusing at times. 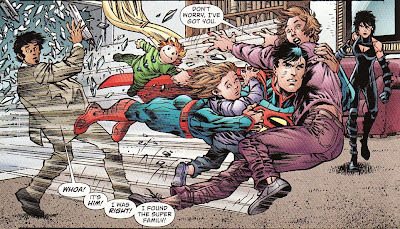 At one point we had the present Superman in the Perez book, a younger Superman in Justice League, and a younger Superman in Action. Perez was sort of handcuffed because he didn't know what Morrison was going to do or not do. Could Perez use Kryptonite? The Parasite? Luthor? 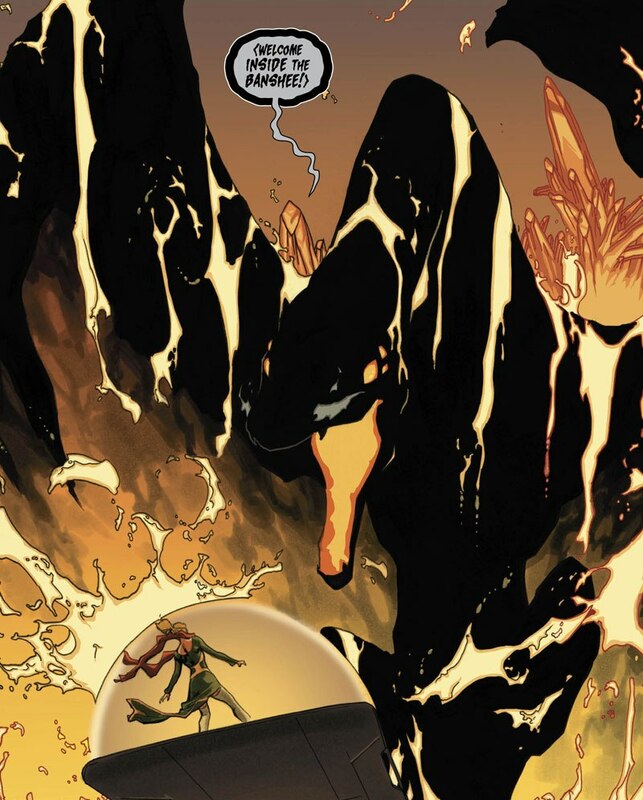 Or did DC allow Morrison to have the 'first' appearance of everything? I guess I can understand Perez's frustration. And as much as I am loving Action, it isn't really reading like Man of Steel or Superman Secret Origin. He doesn't seem to be in a rush to establish this Superman and some of the more familiar parts of his mythos. So when will things be caught up such that everyone who wants to write Superman is playing on the same field? It sounds like Perez feels artistically stifled by full scripts where writers delineate everything including panel breakdown. Unfortunately the current standard is for full scripts. That's why Perez is currently happy on Worlds' Finest. Levitz provides complete scripts but let's Perez make some decisions on how the book should be layed out and look. Perez says that Levitz trusts him and will rewrite something to fit Perez art. I wonder if that ability to change scripts on the fly, to allow some artistic freedom, is reserved only for veterans like Levitz or for everyone. Anyways, I don't mind these looks into the creative process even if it as ugly a process as this sounds like. It certainly doesn't sound like there was much harmony between the editors and creators in those early Superman issues. Legion of Super-Heroes #10 came out this week and was another solid issue for this title that seemed to be struggling to find itself for a while there. 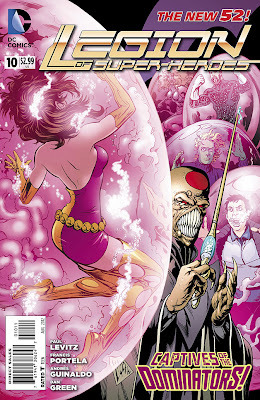 Writer Paul Levitz has righted the ship a bit by concentrating on the Dominator storyline for the last couple of months. While new plot threads have been introduced and we have checked in on some folks we haven't seen in a while, the main thread is the Dominator plot and that has tightened up the feel of the book tremendously. It also helps that Levitz knows these characters so well and keeps the characterization solid in between the action pieces. It is the small things with the Legion that make it so wonderful, the interaction between the characters and their stories. Unfortunately, artist Francis Portela only provides half the art on the book. I feel like Portela would be a mega-star if he was put on a bigger book but I am thrilled he is still here on the Legion (for now). He really has brought a fresh dynamic to the book. It reminds me how dramatically the feel of the book changed when Keith Giffen took over on art so many years ago. The remainder of the art is done by the team of Andres Guinaldo and Dan Green. It has a rougher feel to it, harsher, which mirrored some of the pages they were responsible for. 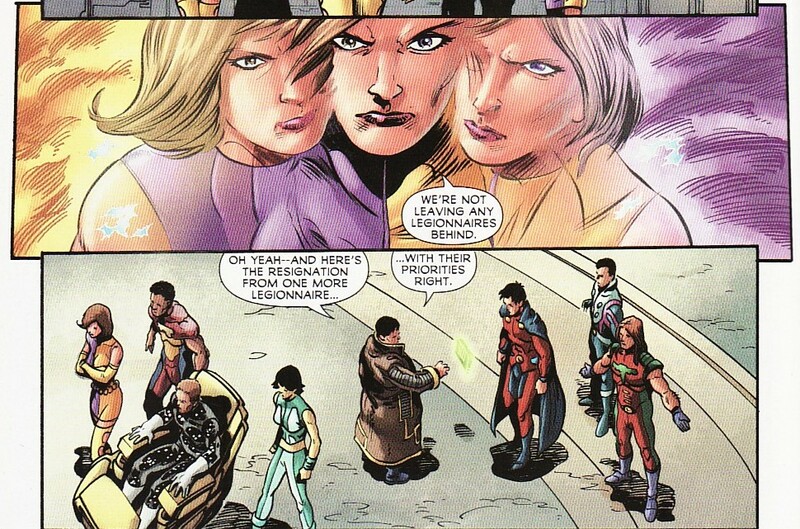 Between the Legion Lost crew and the kidnapped Brainy and Dream Girl, the team isn't faring too well. While the lost Lost are a mystery, the Legion are all to aware that the Dominators are responsible for the missing Querl and Nura. And with the UP denying them the ability to act, the Legion takes it upon themselves to muster the evidence to spur things along. Incredibly, it is the usually staid and morally upright Cosmic Boy that takes matters into his own hands, breaking into a Dominator embassy on Earth looking for some information. I like his stealthy all black ninja gear. His plot is nearly foiled and he is almost captured until Ultra Boy scoops him out. I like Jo's jibe that Cos isn't a spy like the Espionage Squad. Still, things must be pretty tense for Rokk to do this. That speaks volumes. As for Brainy and Dream Girl, they have been captured and are in a sort of Dominator prison. It is clear that this is a low security prison for Legionnaires they have ranked low on the power level. It is also obvious that the Dominators have been biopsying them for the genetic code. Brainy and Dreamy are such a combustible duo. He recognizes she is smart but can be superficially flighty. She says things like 'sweet dreams' to him, I am sure, to get a reaction. I have said for a while that romance is inevitable between these two. I still think that. 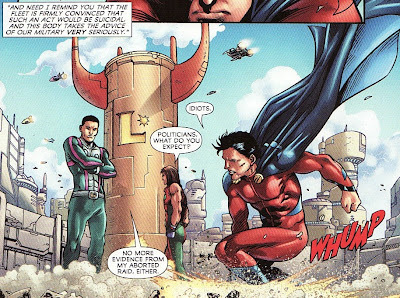 While Rokk was breaking and entering, Mon-El was trying to convince the UP to declare war on the Dominion and cut the Legion loose. One of my complaints last time was that the UP was reluctant to do just that given the Dominator plot on Panoptes and ... oh yeah ... the invasion fleet they sent into UP space. At least here we get a little explanation about their reluctance. The UP tells Mon-El they are outgunned and declaring war is suicide. I guess a bad explanation is still better than none. Some of the other members aren't happy about the Legion kowtowing to the UP's mandates. 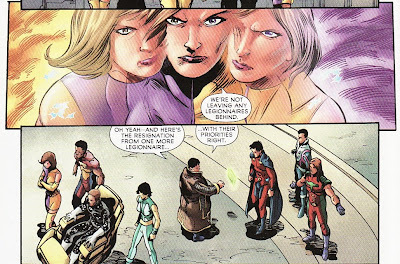 A cadre of Legionnaires and academy members actually quit, going rogue to try to save Brainy and Dreamy. It is a motley crew. Sure Star Boy is potentially devastating but he is still nursing his injuries and is a bit too emotional about Nura. Bouncing Boy and Triplicate Girl make sense. Luorno has always taken these sort of things extremely personal, most likely born from her losing a body to an enemy. 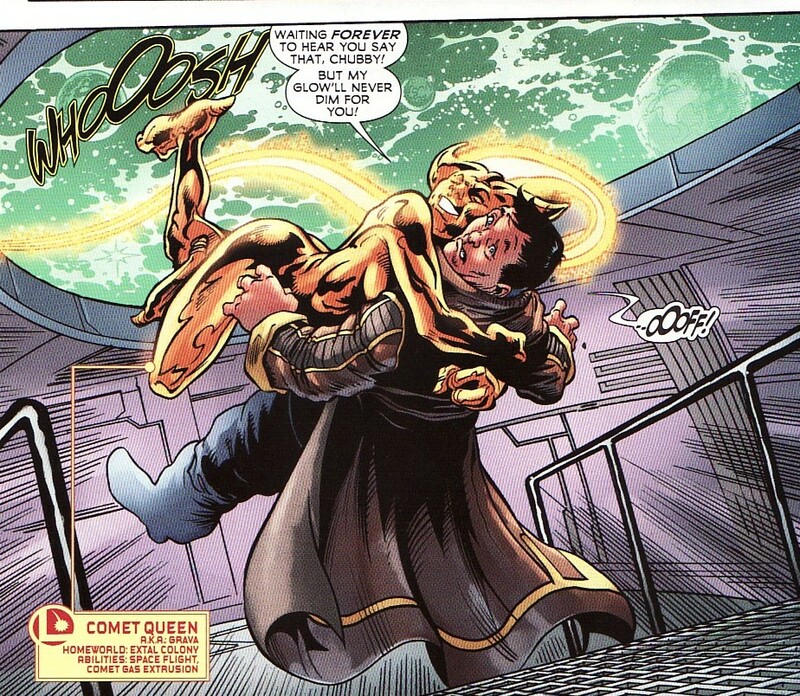 She was part of the cabal to avenge the pocket universe's Superboy as well. She seems fierce. But we aren't talking big guns here. 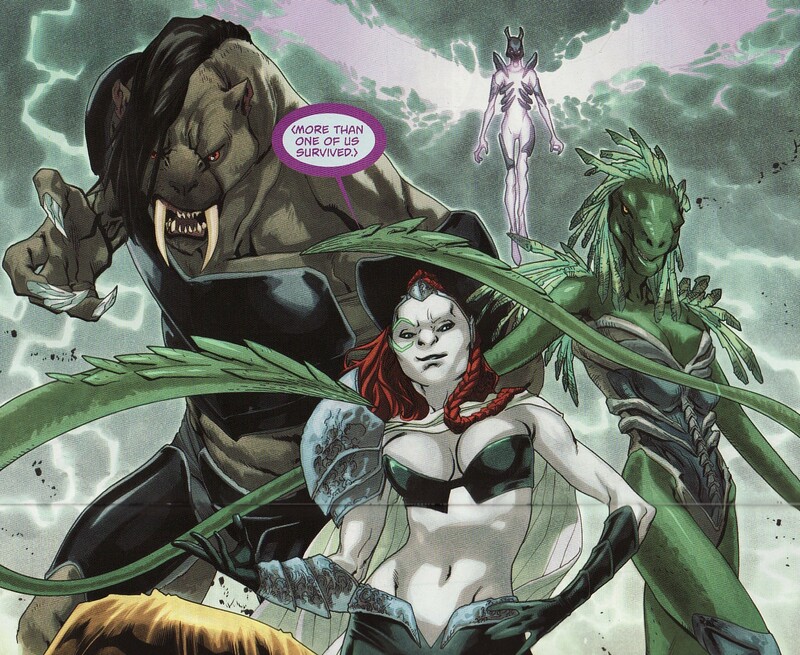 And the academy members are weaker versions of Dawnstar and Saturn Girl. Good skills for this rescue mission but untested and naive folks. And one other member will be named later. This feels like it has disaster written all over it. As for the captured members, they have gone through Legion Combat training. They escape the low security cells and raise some havoc before being overwhelmed by the lower caste Dominators. These Dominators lives exist only to serve the higher castes, even if that means suicide missions. I like this peeling back of the structure of the Dominion in this arc, showing us the uglier bits at the bottom of the social pyramid. Makes it even easier to dislike them. Finally, Nura gets a vision that help is coming. And someone will betray them. Look at how she swoons into his arms. I am telling you romance is around the corner. Now as for the betrayal. It may be that she is seeing a feint, some plot where someone appears to be betraying the Legion. My guess? That Star Boy quits the Legion after this disastrous mission. He realizes that Dreamy no longer loves him and can't be near her. This quitting of the Legion is a betrayal. Or maybe he is the one who feints, using the Dreamy/Brainy romance as an excuse only to sacrifice himself so they other can escape. Either way, I don't think Thom escapes this arc unscathed. As for the mystery 'other Legionnaire' ... it's Comet Queen. She, of course, would be willing to follow Bouncing Boy anywhere. But it is hinted she has a key role in their 'plan' so was necessary for something more than her loyalty/infatuation. Maybe the plan is her faking a betrayal? I hope not. And she better not die either. While she isn't a favorite, she is silly and fun. That is something needed in comics these days. So lots of progression of the Dominator storyline. We even learn that the super-Dominators are cooking nicely and will be ready shortly. Things are going to come to head and soon. These sort of issues are a welcome change from the meandering sort of rest issues from earlier in this reboot. And there are some mysteries to mull over. It still isn't giving me the magic of the old days, but this Legion is at least closer to the mark. 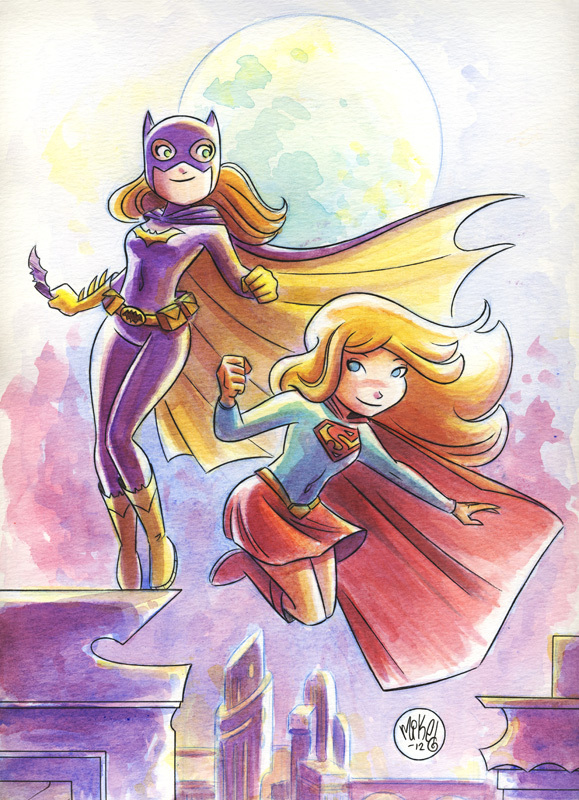 I have gushed over Mike Maihack's Supergirl/Batgirl art in the past on this blog. Maihack seems to be able to capture the optimism and enthusiasm of Supergirl in his wonderfully cute comic strips and pictures. If I was at the convention's art auction, I think I would be bidding pretty fiercely for this piece. The auction is at the end of the convention day so anyone going should make sure to try to hit the auction or at the very least thank Maihack for his work (both here and on Cleopatra in Space). 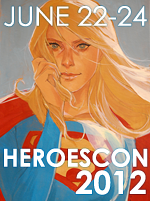 Here is a link for the convention itself for anyone in the NC area still on the fence about going: http://www.heroesonline.com/heroescon/ I love that Supergirl is the character on the convention logo. In some ways I am glad I am not attending. There are so many creators I would want to meet and get art from I would probably mentally overload and go catatonic! Supergirl #10 came out this week and for me was something of an up and down issue for me. There was a lot of good stuff here, small nuggets that continue to build the foundation of this Supergirl's mysterious origin. 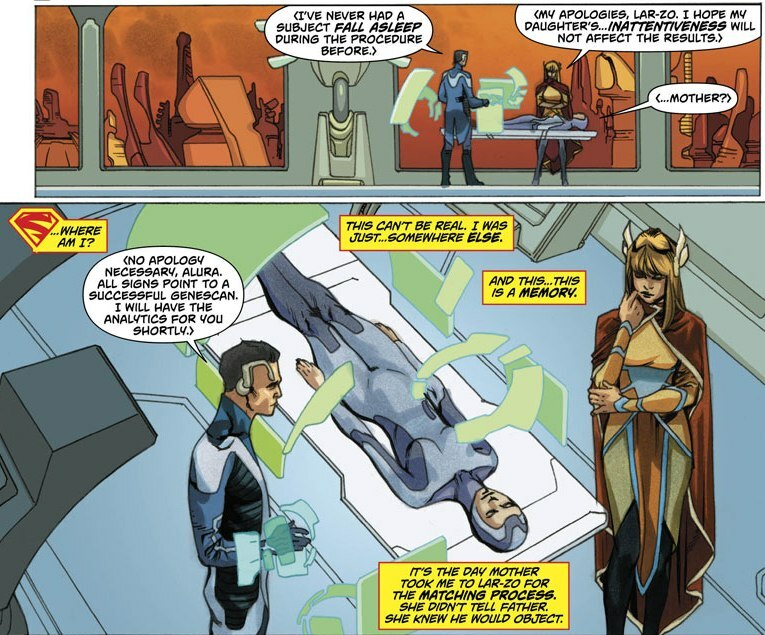 Most of that is revealed in the opening scene of the comic. And Supergirl continues to show that her heart is in the right place, risking herself to fight the villain and save the innocent. But the bulk of the issue takes place within the nightmare world inside the Black Banshee. And since we are in a dream world, basically all bets are off. Physical laws are somewhat meaningless. Thought can become a sort of reality. So the big battle lost some of its tension. The fight itself is inspiring, Kara using every skill she knows to try to get back to Earth. But I felt I simply needed to roll with whatever happened since this was a mutable place. 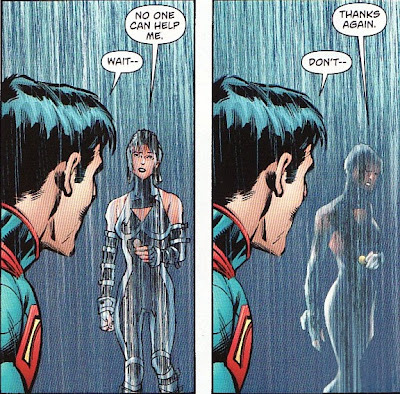 Still, Kara definitely plays the hero here, showing some internal fortitude to keep her wits about her. 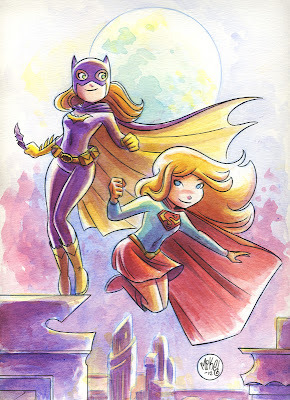 Michael Green and Mike Johnson continue to tease us with snippets of Kara's past which I continue to shuffle and reshuffle in my head to try to figure out just who this Kara is. Supergirl #0 is only three months away so things are building to a crescendo. I have to say slowly but surely this Supergirl is winning me over with her voice and actions. And Mahmud Asrar continues to sparkle here. 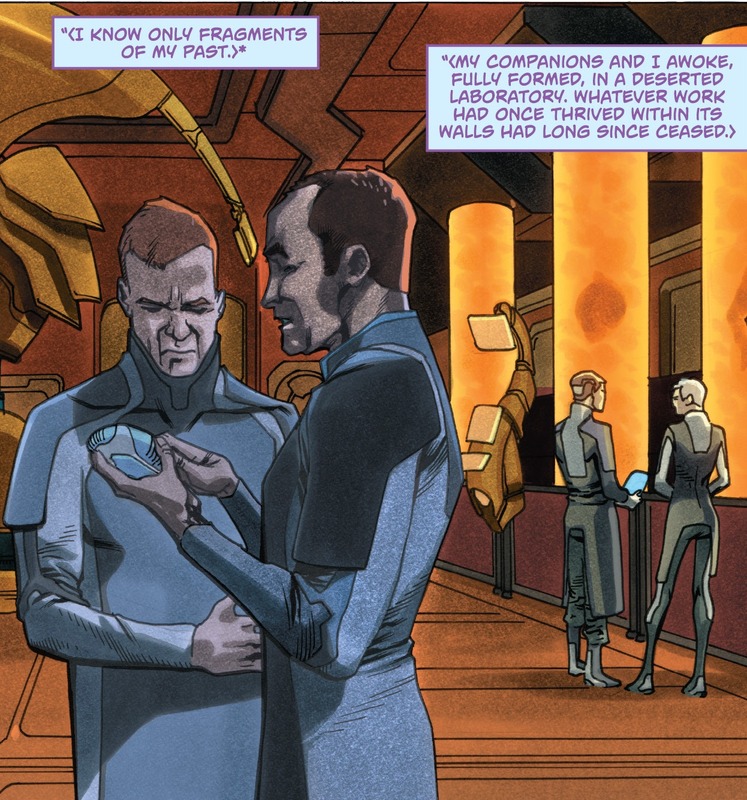 I have to praise colorist Dave McCaig as well for bringing the marker stylings of Asrar to life. In particular, the use of a dominant burnt orange on this cover, in contrast to the black of the dragon works wonderfully. It really stood out on the rack yesterday. 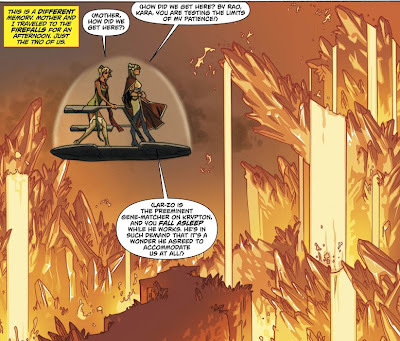 Inside the nightmare world of the Banshee, Kara relives some memories from her time on Krypton. First off, we see Kara being scanned by a gene-matcher on Krypton. It is implied that he somehow uses the information from the scan to pick an ideal mate for Kara, some sort of genetic match. This harkens back to a more sterile sort of Krypton, something more Byrne-like where there wasn't necessarily love or physical contact. And I think you can glean a lot of information about how Kara feels about this by her reaction. She falls asleep. I don't think this was an important event for her. I doubt she is hoping for a computer-picked Prince Charming. She is more independent than that. That memory swirls into a mother/daughter trip to the Fire Falls. Alura isn't happy with Kara's little nap. So it is clear already that Kara's relationship with Alura is going to be complicated much as it was in the last Supergirl book. Zor-El is training Kara to fight robots; Alura is arranging her marriage. I am a big fan of the Fire Falls having written about them before. But here they are stunning cascades. Again, McCaig deserves a lot of the credit. Kara is angry about the whole thing. She didn't want to gene-scan to begin with and later states it is her choice. But the more interesting part of this is Alura's comment above. She and Zor-El weren't gene-matched. They found each other ... uniquely. So what does that mean? 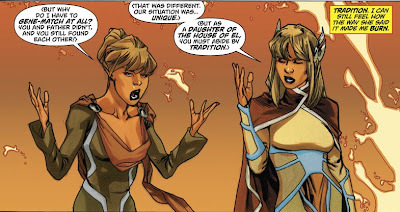 Is it simply that Alura didn't abide to tradition that time but it was a one time thing. Therefore, Kara has to submit. Or does it mean more? 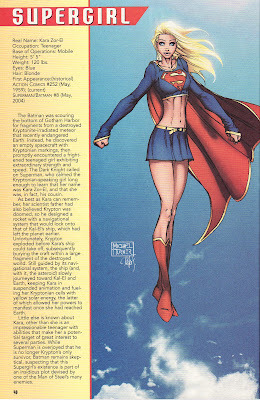 I keep worrying and wondering about Supergirl's origins. For example, is she made of 'world killer' tech. Could this 'unique' interaction be something more. That outside of the tradition, Zor and Alura were matched for potential super-gene offspring? It is all very Bene Gesserit/Kwisatz Haderach I know. I guess we'll see. And yet, who knows if any of this conversation is real? This is a fever dream in the Banshee. Maybe these events didn't happen in this manner. 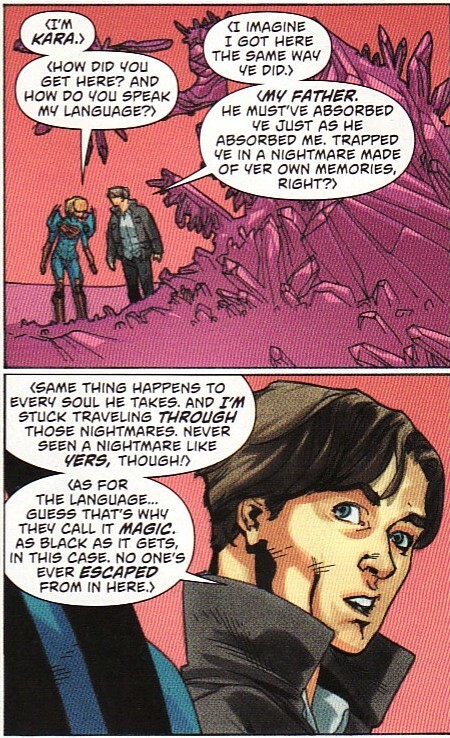 In fact, Supergirl even realizes that these are warped memories remembering that she was absorbed. And that leads to the arrival of the Banshee. He has taken the form of a flamedragon, a mythical monster from Kryptonian fairy tales. This thing sort of has the feel of the Nightwing creature. This whole opening memory scene is fantastic, adding another layer to the enigma of Kara's origins. 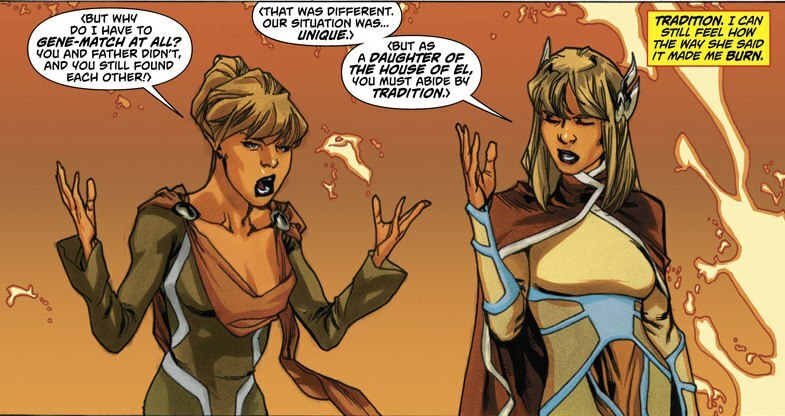 I hope we see more of this mother/daughter relationship in the future. It speaks volumes that Kara's nightmare world is her spending time with Alura. It does make me worry about one thing. I don't think I will be very happy if it turns out that Alura is the person who shot Zor-El, angered at Zor's plans for their daughter. 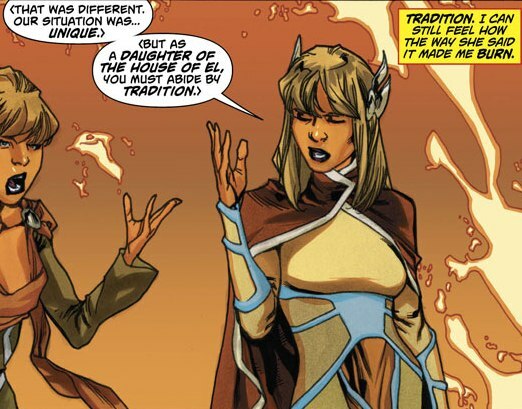 This is a dream world, so when faced with a dragon, Kara somehow thought-morphs her clothes into traditional armor. One thing I love about this panel ... it help explains those goofy boots of her current, more cermonial, outfit. The red coloration of the boot carries above the hinge of the joint but exposes another color when bent. That is a slick armor look and it mirrors her current open-kneed look. Narrowly escaping this initial attack, Kara discovers another soul ... Thomas Smythe, Siobhan's brother. 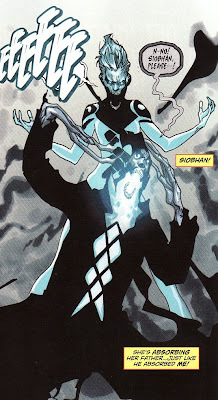 Usually souls that the Banshee has absorbed don't manifest like Kara has; they are fully absorbed. And Thomas has been roaming around this nightmare world since he was also partially absorbed. Supergirl realizes that she hasn't defeated the Banshee by overwhelming him with her power. He has to get out of this place to help Siobhan in the outside world. Again, there isn't much explanation about why Kara or Thomas hasn't been fully subsumed. But I guess I can chalk it up to her power and his familial connection. The Banshee tracks down both of the lost souls in his world, thrilled to find them both in one place so he can 'kill' them, taking them over completely. And, at least he explains why Thomas' sacrifice from last issue didn't work. The curse needed Black Banshee to absorb his kin who bore 'the mark', Siobhan. 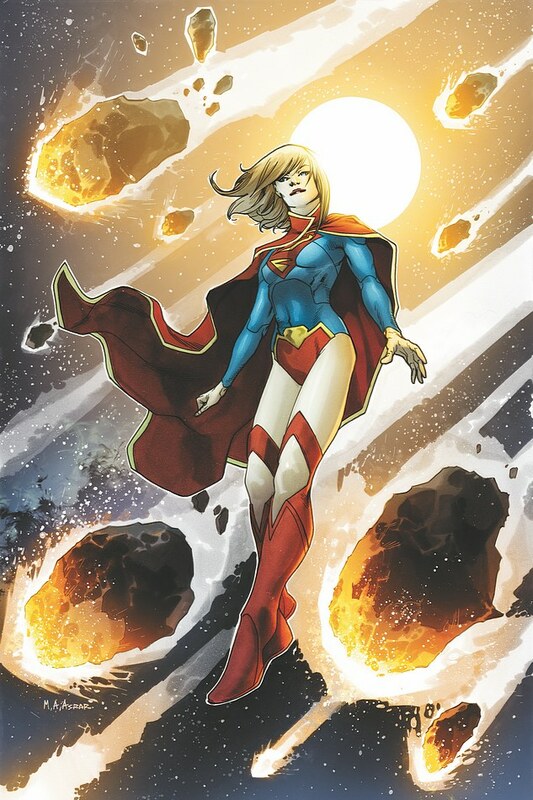 In another one of those moments I have to simply accept, Supergirl uses some of her remaining 'yellow energy' to form a Kryptonian battle sword out of the air. And then she jumps to try to ride the dragon. It seems a bit crazy to think that she should be able to grab a dragon and stay seated on it while splitting her mind sword into two ... but she does it. And then she defeats the Banshee's dragon form, beheading it. I suppose I should simply think that this shows how strong Kara is mentally, that she can bend this nightmare to her will, doing amazing things in the dream-Matrix. And again, the fact that she is willing to risk everything to help Thomas and Siobhan shows that this Supergirl is a hero. 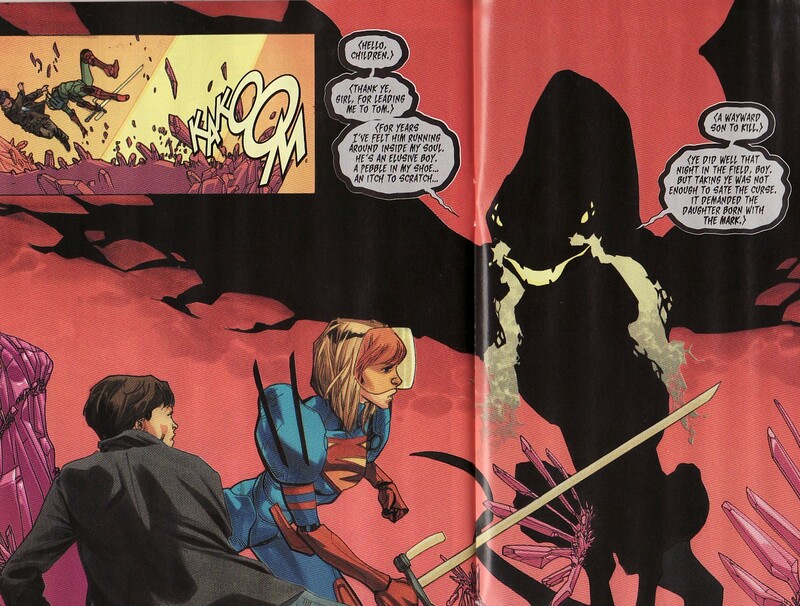 The 'death' of the dragon affects the Black Banshee and Supergirl and Thomas are both spit out of his body. And dazed, Siobhan takes advantage and uses her scream to absorb him. Hmmmm ... do you think absorbing someone as evil as the Black Banshee is going to affect Siobhan in the future? Do you think that maybe she will veer towards super-villain now? Or at least struggle with those thoughts? Great panel here by Asrar. You feel the effort behind that scream of the Silver Banshee. But the reunion between friends and siblings has to be put on hold. Guess what happens! The police/military show up and threaten Supergirl with 'lethal force'. It is enough to make me cry. Supergirl scoops up the Smythes and flies off. So what have we learned. Kara has a strained relationship with her mother, perhaps one built on the conflict between societal expectations and personal dreams. Zor-El and Alura met in a unique way, which may portend nothing more than luck and love. And that Supergirl will continue to fight to protect people and to defeat evil. All of that was great. The fight with the Black Banshee seemed a bit too easy and too short (perhaps because there were plenty of splashy pages limiting story telling). And I hope I can get through an issue without the police or the army threatening or attacking Supergirl. Still, this Supergirl seems to be growing more and more into the sort of new hero I expect 'Supergirl' to be. Now if only she could communicate with people and stop being treated like a villain. September marks the year anniverary of the DCnU and DC has decided to celebrate the month by having all the titles have 'zero issues', jumping on points for the books with origin stories. It also is a month where the 'third wave' of titles are being introduced. So it's goodbye JLI, Voodoo, Resurrection Man, and Captain Atom. Hello Phantom Stranger, Team 7, Talon, and Sword and Sorcery (starring Amethyst and Beowulf). I am only interested in Sword and Sorcery as I have been hoping for an Amethyst revival for a while. And what a great cover by Asrar, nice perspective, nice expression, and heroic. 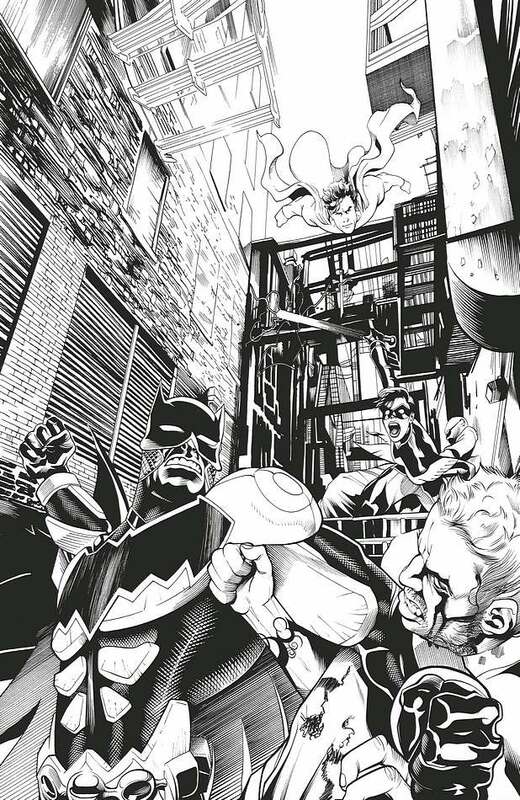 • Grant Morrison weaves the history of Clark Kent’s early days in Metropolis! I haven't heard of Ben Oliver before but if this cover is any indication he has some serious skills. I am glad that there is a mention of Clark Kent here. And I think that this flashback issue will help build more of the foundation of who this Superman is and how he became this crusader for the oppressed. The new creative team of Scott Lobdell and Kenneth Rocafort take over here. I have always been a fan of Rocafort and thought he did a great job on the latter issues of Paul Cornell's Action. 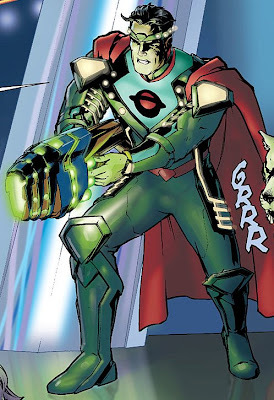 I hope Lobdell is able to capture the heroism of Superman and not make him dark or broody. 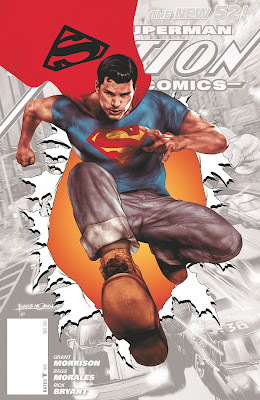 Interesting that his first issue is a Jor-El story and not a Superman story. And the Eradicators are back? 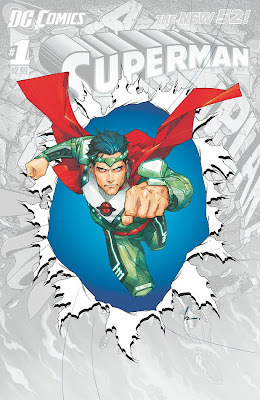 • This bloody chapter of Superboy’s history ties directly into issue #1 of the series – and the future of the entire DC Universe! 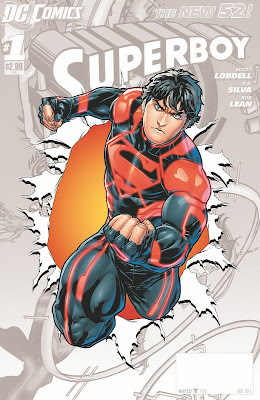 With Lobdell moving to Superman, it looks like Tom DeFalco is stepping in to write Superboy. I am glad that RB Silva and Rob Lean are staying on as the art team. While it will be good to read the earliest parts of Superboy's history, how he was made and put in the tube, I am actually ready to move beyond N.O.W.H.E.R.E. and into newer adventures on this title. And this origin will impact the whole DC Universe? Outside of Supergirl and Action, this is the book I am most excited to read. 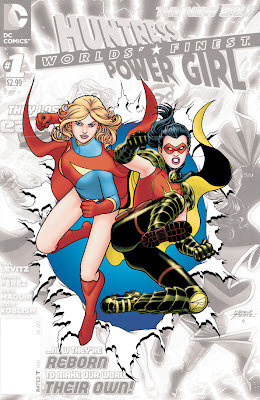 This is an Earth 2 story so that means it is Supergirl and Robin in action ... not Power Girl and the Huntress. So I can't wait to see how the personalities we have seen in Worlds' Finest, post-Apokalips are different in this earlier time. And their first adventure! Together again ... for the first time! Awesome. Plus ... as bonus ... the entire book is drawn by Kevin Maguire. • It’s the tragic origin of Earth 2’s greatest villain! 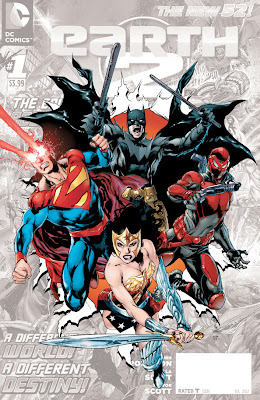 • Don’t miss Superman, Batman and Wonder Woman in action on Earth 2! So I haven't been reading Earth 2 because those heroes will always be WW2 heroes in my mind. I know I may be missing something spectacular. So this issue, a look back at the E2 trinity might be a way to lure me back. I am interested in seeing how Robinson handles these characters in this world. • SUPERMAN comes face-to-face with high-tech weapons on the streets of Metropolis. 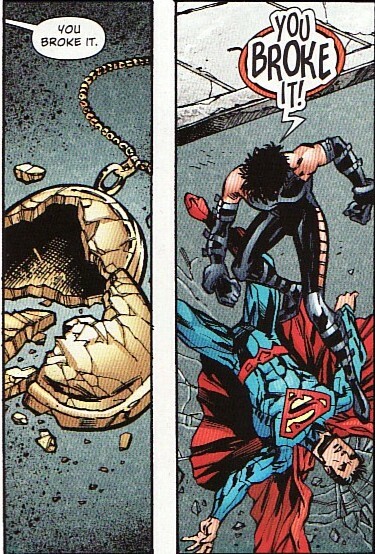 Batman in the Smallville universe is enough of a hook for me to be intrigued. But then it was revealed that Nightwing in the background is Steph Brown! Miller wrote Batgirl, a book I loved, so it is great that she will be back! I am enjoying this book way more than I expected. • And who’s that new intern at the Daily Planet? So a SFA Parasite! Fantastic. But who is the new intern at the Daily Planet? I hope it isn't the Parasite's secret identity. 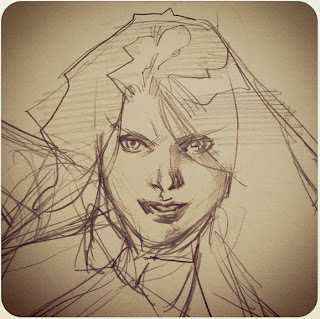 I want to see me some Linda Lee! 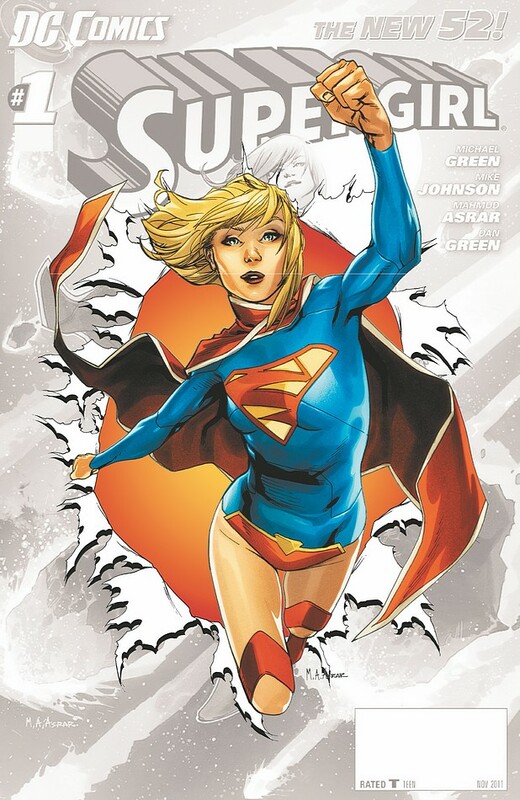 Lastly, the trade collection of the DCnU Supergirl title will be released in September. I am really hoping that we get some extra material ... a foreword, an interview, some process pieces, a script ... something to make this more than a collection. Looks like a very interesting month.